Wow. We know it. Our customers know it. Even some of our competitors know it. Since we launched SparkPost a year ago, we’ve been helping companies do some pretty amazing things with API-driven email, and our service has transformed the market for email delivery services. But we were genuinely thrilled this week to learn that SparkPost was named a recipient of the Red Herring Global 100 award. SparkPost CMO Steve Dille was on hand for the award ceremony in Los Angeles last week. Judging from his glamorous appearance on the red carpet with Red Herring Publisher and CEO Alex Vieux, a little Hollywood style may be coming home to our to San Francisco office! Since 1996, the Red Herring 100 lists have named the most promising private ventures from around the world, and the awards are widely recognized as one of the industry’s more prestigious honors, with hundreds of candidates from each continent competing for a spot. SparkPost joins the formidable global list after having been named a North American winner earlier this year. In making selections for its list, Red Herring evaluates a pretty exhaustive list of factors, including technology innovation, market disruptiveness, business performance, growth rate, team quality, and customer adoption. All of these are important parts of the SparkPost story, but it’s the last two that I’d like to especially acknowledge, something that’s especially opportune now that Thanksgiving is almost here. All of us at SparkPost very thankful for the ways our customers have trusted us to help their businesses. And, to that, I’d add that I’m personally grateful for the amazing people that make up our team. 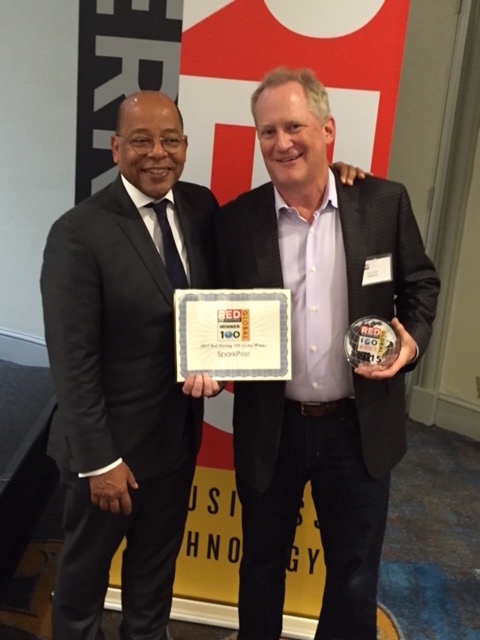 And, of course, a big thank you to the folks at Red Herring—we’re thrilled to be named to the Global 100 list. So, a very happy Thanksgiving to everyone in our community. We’re taking a couple days off the celebrate the holiday, be we’ll be back next week!